Here at Prosperity Pointe Assisted Living, we are passionate about ensuring you and your loved ones are at ease with the transition into an assisted living home. It can be an overwhelming process for everyone involved, which is why our staff is dedicated to making the process as smooth as it can possibly be. 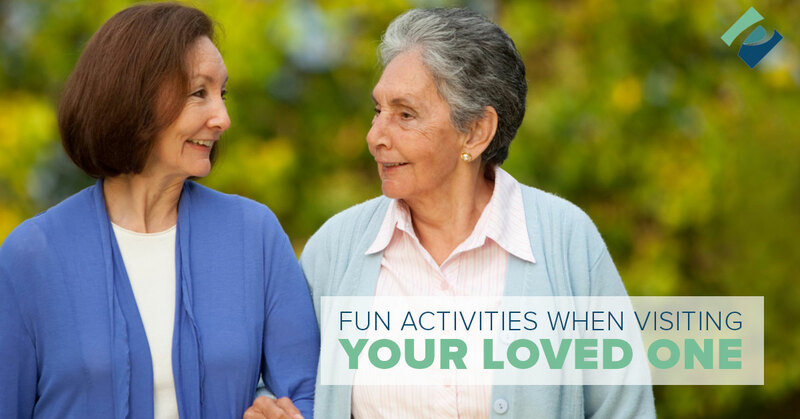 One of the things that can sometimes be hard to transition into is learning how to interact with your loved one now that their lifestyle is changing. Oftentimes those who come to live in our beautiful community are battling health issues that make day-to-day life harder than it once was. From our excellent memory care programs to our outstanding staff, we are here to help your loved one get the care and assistance they need. Looking for an assisted living facility in Knoxville? Click here to learn more. We highly encourage people to come visit their loved ones at our facility. Not only does it make the transition easier for the new member of our community, it also keeps your bonds with your loved one strong. If you want to come visit, but you aren’t sure what exactly to do with your loved one when you arrive, consider these tips. When the weather is nice, spend some time with your loved one outdoors. No one is too young or too old to not benefit from fresh air. Take up a fun activity like bird watching. Bring along a bird book and see what birds you can identify together. Even if your loved one can no longer take long hikes, they most likely can benefit from some mild strolls. Identify flowers on your walk. Try to learn new things about nature together. Use these activities to stimulate conversation, talk about memories, and to give you both a sense of accomplishment as you finish projects. If you are feeling really ambitious you could start on a big project together, to work on every time you visit. You could start a family quilt, or a scrapbook highlighting the many years of your loved one’s life. As we age, our minds can start to struggle with simple tasks and memory loss can occur. One of the best ways to keep a mind sharp is to use your mind. Invest in some new puzzles on your next trip to visit your loved one. Do they enjoy crosswords? Bring a new book of crosswords you can work on together. Do they have any favorite games? Take the time to play some of their favorites. Puzzles and games are an excellent way to pass the time together, have fun, and sharpen your minds. It seems simple, but one of the best things you can do is to simply spend time with your loved one engaged in meaningful conversation. Put away the cellphone and distractions, and focus on your loved one while you are visiting. Take the time to ask questions about their life, to share about what is going on in your own, and to listen to their favorite stories. If your loved one is struggling with memory loss, dementia, or Alzheimer’s you may feel like your conversations go in circles and are meaningless. However, your time spent there and the conversations you have likely mean the world to your loved one. Remain patient, even if your conversations include the same stories every time you visit. Being in an assisted living center can start to feel very lonely for many residents. These simple conversations help to break up that loneliness. Interested in the programs we offer at our assisted living center in Knoxville? Click here to learn more.